All objects, signs and even services are meant to tell stories – and the object as such to disappear. Anyone who has nothing to say tells stories. And for the last few years has been strongly supported by PR agencies and all those journos and professional politicians who simply repeat what they’re told. While about a decade ago there were many constantly albeit often inconsistently holding Michel Foucault's notion of the “dispositif” high, the flavor of the day is now “narrative”. This is certainly true when it comes to design, and of course architecture, too. All objects, signs and even services are now meant to tell stories. Any old stories. As if they no longer even existed as objects. Although the word “object” as a verb rather than a noun expresses that element of resistance, through which in the course of interaction both a relationship between the object and those who use it and something like a subject arise, as this subject can first develop the experiences on which it is based through that interaction. That, however, is no longer the case. Objects are becoming pure “teller machines”, those appliances from one can withdraw cash and that tell you how much cash it is, tellingly. After all, narratives are nothing other than tales, meaning they merely allow you to imagine that behind the object itself there is some substantive reason for it other than its objectivity. Which makes it easy to foretell it all and thus strip it of any intrinsic specificity. Perhaps, when formulated so succinctly, things remain a little incomprehensible. But that’s easily fixed. Because in fact we probably all know from experience, for example when visiting an apartment or even only the office of an acquaintance or friend, that the latter hardly respond to the interest or even excitement we show there in the one or other object. Instead they immediately set about reporting, i.e., telling us how and where and under what conditions they acquired the item in question. Only that seems truly exciting to them, because it was found by chance, or they bargained hard for it, had such difficulties getting it back home. As if that can be of any interest to anyone other than the person telling the story. In reality, such a narrative merely says that this person has evidently not interacted meaningfully with the object, and does not wish to, and in fact do not like it at all, but simply love the story that they tell about it. The story therefore serves to justify the purchase, although the object hardly needs the story itself. Indeed, the narrative constantly implies secret second thoughts, for example, it calms the owner for having bought or procured the object or the service. Nov one should definitely mention that of course all objects mean more than simply what was traditionally termed their function. Needless to say that the discussion about the various reasons for acquiring and using things also applies to design. For without doubt the one or other item is only acquired in order to enable the act of procurement or purchase – “Buying things is fun, owning them occasionally frustrating”. And other things are used to boast, to dispel fears, to fulfil dreams (purportedly), or to mask concerns. Yet none of that requires a story. It is better to simply live consciously with these facts and to analyze them accordingly. And here are no doubt also those “conversation pieces” people collect. Clothing, jewelry, accessories, not to mention autos, furniture and other formations are perfectly suited to somehow being strikingly designed and to trigger any amount of chat in the course of small talk. It is just that these things don’t tell stories but simply at best talk about themselves. They catch the eye and are designed to do just that. Meaning they don’t need to be upgraded or justified by some personal myth or other. They achieve the purpose intrinsically, they function by virtue of their design and therefore require no further stories. And there’s more: Any compulsive use of narrative completely ignores the design itself. The story actually substitutes for the design. Because you can always tell some story or other about the most stupid, most unimportant, or most awfully designed thing. Since in this regard, the story because immeasurably more important than the design and simply replaces it. What is even more absurd is that precisely the designers also call for such narratives and really claim that the things and the signs and the services need to be conveyed by the narratives and then be sold, how cheap is that. They slump into what philosopher Ernst Bloch so intelligently called the “banality of depth” and in the process simply abolish themselves. Of course, possibly in society today the narrative mania has long since become so ubiquitous that any advocacy of rediscovering the objects in objects is simply obsolete. Because the sheer effort to interact with objects is now avoided and considered too complicated. After all, many objects have long since ceased to possess such recalcitrant dimensions, and instead seduce us by only being barely perceived, or only fleetingly, and that they are liked precisely for the fact that they only tell roundabout stories that thus ostensibly make them comprehensible so that we can make them our own. In the process we all become fools, not subversive and inquisitive jesters, but simply narrow-minded. They make fools of us. 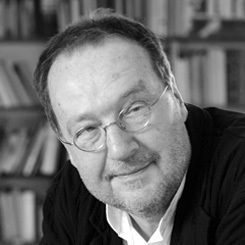 He is an author, design theorist, corporate consultant, curator and organizer; he has been, among other things, CEO of the German Design Council, Advisory Council member of documenta 8 and Founding Dean (and until 2013 professor at) of the Köln International School of Design/KISD. Erlhoff was founder of the Raymond Loewy Foundation, is a founding member of the German Society of Design Theory and Research and as a visiting professor heads projects and workshops at universities in Tokyo, Nagoya, Fukuoka, Hangzhou, Shanghai, Taipei, Hong Kong, New York and Sydney.